The availability of pre-orders isn’t the only new development in iPad-land. Apple also updated its site with a plethora of new details about its latest and greatest device, from information on the 3G networking capabilities to a more in-depth description of the iBooks application. Let’s take a look at what caught our attention. In introducing the iPad, Apple said that it had struck a groundbreaking new deal with AT&T, allowing iPad users to get 3G access on their devices without having to sign up for a contract. Users would have two choices: a $15 per month plan that limited their data consumption to 250MB and a $30 per month plan for unlimited data. Plans could be signed up for or canceled at will, but questions continued to abound. On Friday, Apple answered some of those questions on its Website, with a page on the iPad’s 3G support. Those users who choose to sign up for the metered 250MB plan will be provided with information on the iPad’s screen to let them know when they approach the data limit: specifically, when they have 20 percent, 10 percent, or no data remaining—just like the iPhone’s low battery warnings. When the alerts pop up you have the option of adding more data or waiting until later. 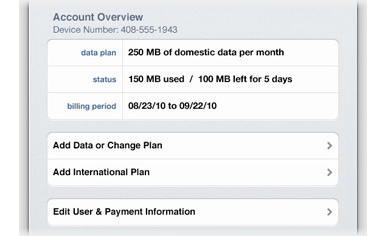 Signing up or canceling your data plan can all be done via the iPad’s Cellular Data Plan window (pictured). You can even change to the unlimited data plan from the 250MB plan, or add another 250MB of data if you want. You’ll also be able to view how much data you’ve currently used and how many days are left in your plan. A screenshot on Apple’s site also alludes to an “International Plan,” though Apple hasn’t provided any details on it. The iBooks application won’t be shipped on the iPad—rather, it will be a free download from the App Store. While many of the details of the app were already known, Apple does drop a few new tidbits on its iBooks page, such as the fact that free ePub titles available from elsewhere can be synced to iBooks via iTunes, allowing you to read them on your iPad. Apple also says iBooks will remember where you left off when you finish reading, allowing you to pick up from there next time you launch it. And touching and holding any word lets users look it up in the built-in dictionary, on Wikipedia, or search for it in the book or on the Web. In addition, the iPad’s VoiceOver screen-reading technology allows you to have any page read aloud to you. A similar feature on Amazon’s Kindle e-reader touched off a feud between the online retailer and the Authors Guild, resulting in an agreement where publishers get to decide on a title-by-title basis whether that feature is available. 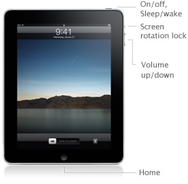 One fact that might have escaped the notice of even eagle-eyed iPad watchers is the physical screen rotation lock. Anybody who’s used the iPhone or iPod touch for any length of time knows that it’s hard to read while lying down, as the accelerometer frequently flips from portrait to landscape. Thankfully, Apple’s combatted that problem in the iPad by adding a screen rotation lock switch on the right-hand side of the iPad, right above the volume controls. On its page about Accessibility, Apple adds that you can now route both left- and right-channels of audio to just one headphone, for those who might have a hearing issue in one ear. Squirreled away on the iPad's Specs page is a new addition as well: the iPad now supports AVI videos in MotionJPEG format, with data rates of up to 35Mbps, resolutions of up to 1280 by 720 pixels, and PCM stereo audio. iTunes has never supported any AVI files in the past, and the huge data rate goes way beyond what even the Apple TV can handle. Notice anything that our detail-combing iPad team missed? Chime in below to let us know what’s got your attention.